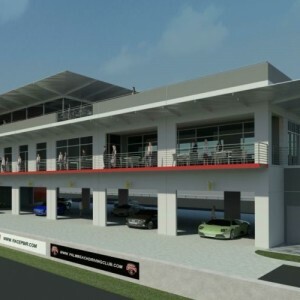 The PBIR Pit Suites/Clubhouse is a new multipurpose 3 story bldg. inside the PBIR racetrack facilities (Pit Lane area) . Pit Garages are on the first floor. 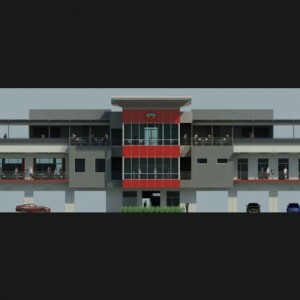 On the second Level are the Private Suites/Flex Space, The Palm Beach Driving Club (private Club), Offices and Press Room. 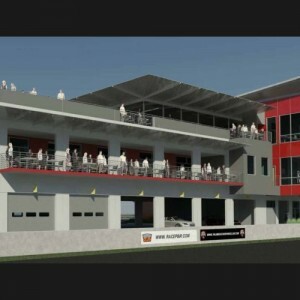 On the Upper Level there is an Observation Deck/Concession areas on both sides of the building and the Racetrack Control Room centrally located. The design of the Building is contemporary with some key elements and materials inspired by car racing.